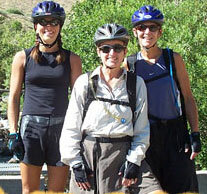 Join Sierra Adventures for a girls-only expedition that can include just about any activity we offer. Intro: O.K. girls, take your pick off our tour options list - bike, balloon, kayak, boogie board, hang glide, horseback, hike, raft, rock climb, snowshoe, or glide with the eagles. Did we miss anything? The Tour: At the designated time, our complimentary shuttle will pick you up from any local hotel or bed and breakfast. Each tour includes your guide, food and beverage and transportation. Your guide can set you up with equipment needs for any adventure. A variety of paces are available. Suggested Clothing and Gear: Gear and clothing needed based on your activity choice.